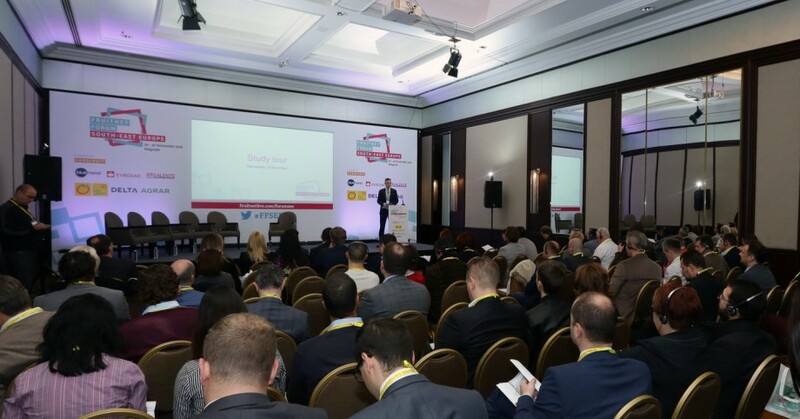 Leading players in south-east Europe’s fruit and vegetable business will hear about market trends, emerging commercial opportunities, new technologies and changing consumer demand at this year’s Fruitnet Forum South-East Europe, Eurofruit’s annual meeting of the region’s fresh produce industry which takes place in Belgrade, Serbia, on 21-22 November. The networking event, which comprises a one-day conference and a day of study visits, provides a unique snapshot of the fruit and vegetable market from the perspective of suppliers and buyers in south-east Europe, focusing on the potential for increasing the region’s fresh exports as well as boosting sales of imported produce in its emerging consumer markets. The conference itself aims to provide answers to several key questions. How, for example, can fresh produce companies in south-east Europe attract institutional investors in what continues to be a rapidly changing international business? Drawing on his work as an economist at the Food & Agriculture Organization’s Investment Center Division, Andriy Yarmak will demonstrate how market intelligence plays a central role in adding value through exports, and how quality control and efficiency along the value chain are critical for those competing in the international market. Later on, one of the world’s leading experts in fresh fruit and vegetables, Piet Schotel of Fruit Consultancy Europe, will comment on various important aspects of the business, including the changing roles that supermarket buyers and importers now play, as well as growing demand for certification in areas as diverse as food safety, sustainability and social responsibility. Plus, he will assess the potential impact of key trends such as organics, health and convenience. This year’s event also includes contributions from leading retailer Maja Jojović, who heads up management of the fresh produce category at Delhaize Serbia. She will assess the latest market trends and explain how retailers are using more sophisticated methods of communication to raise their profile and connect with consumers. Ferrán Cabrera, managing director of Anecoop Praha will explore some of the market opportunities that exist for suppliers into south-east Europe, picking out key trends that will shape the market in the coming years. Mihai Ciobanu of UK-based company Fresh4cast will provide detailed analysis of the latest export and import data relating to the region's fresh produce exports and its import markets. And Alexandros Arampatzis of Greek firm Win Consulting will explain how exporters can promote their products successfully and offer new ideas about how south-east Europe’s own produce business might raise its own profile in future. Elsewhere on the programme, delegates will hear from: branding expert and former Delta Agrar marketing director Julka Toskić, who recently established her own agency AgroBrand; Fred Douven, of Dutch group ABB Growers, who has embarked on a new venture to develop production of the fruit in Serbia; and Eldina Muftić, whose work at Zeraa in Bosnia & Herzegovina has involved advising fruit and vegetable companies in Bosnia & Herzegovina on how to invest in ways that offer exporters the best possible chance of success. Completing this year’s line-up are Karin Goree of Innovative Fresh (Netherlands), David Psomiadis of Imprint Analytics (Austria) and Reshat Ajvazaj of USAID/AGRO (Kosovo). Together, this trio of speakers will deliver our Fruitnet Forum produce export toolkit: a new model for monitoring fresh produce quality at retail through the eyes of the consumer; a new way to fight food fraud by determining a product’s authenticity and origin; and advice on how to meet the certification standards required in international markets. To register for Fruitnet Forum South-East Europe, visit the official website.